Express concern without appearing angry. One of our most requested treatments is to relax the muscles between the brows: the glabellar area. These muscles are activated when a person is feeling concerned, worried, or concentrating, but often comes across as a look of anger. Overactive contraction of these muscles can not only make a person look angry, instead of concerned, they also create deep vertical lines (known as the "11's"), and can contribute to migraines. Neuromodulators (Botox® & Dysport®) are injected into the five muscles in this area giving a softer appearance. The eyes and other facial movements then convey concern and concentration without the detracting appearance of anger. The center muscle between the brows is called the Procerus and pull the brows inward and down. There are also two Corrugator muscles to each side of this that primarily pull inward, but also direct the brows and forehead down. Each person’s anatomy will be slightly different, so it is important to have an injector who carefully examines the area and muscle action to determine your customized injection plan and dosing. Can I just treat this area? This area can often be treated alone, however, depending on your wrinkle pattern, we may recommend treatment of other areas for an even improvement. You can imagine that if you have general wrinkles over the face and then smooth just one area, this may lead to an unnatural look. Younger people with a genetic predisposition to deep lines in this area can usually just treat this area alone as they tend to be free of wrinkles in the surrounding area. If you are looking at treatment of the forehead lines, but do not have a particular concern for the frown lines, it is likely we will still recommend treating this area. The reason for this is that a balance must be maintained with the lift and pull of the facial muscles. If the forehead alone is treated, the downward pull of the frown lines is no longer balanced and can give a heavy brow or angry look. Prior to Botox® treatment, we evaluate your anatomy and movement with you relaxed and then making facial expressions, including frowning, raising the brows and smiling. We will determine the proper location and dose for the injections. We offer complimentary consultations to answer all of your questions and determine the best treatment for you. 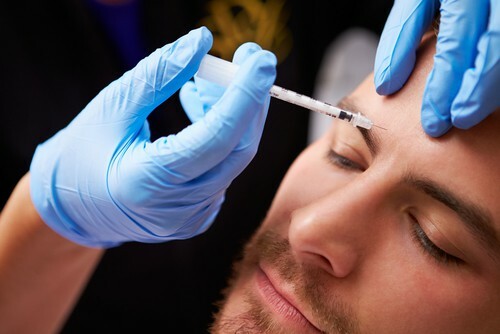 Most patients require 5-7 injections to the area between the brows and over the inner portion of the brows. Some patients benefit from additional injections along the sides of the upper nose, where additional muscles may contribute to creasing in the center of the brow. Injections may feel like a tiny pinch, but are not considered painful. We offer a vibrating tool that distracts from the injections and most patients feel only the vibration rather than the pinch. There is no recovery time. You may have tiny red bumps, like mosquito bites. This generally goes away within minutes. Rarely, a small bruise may occur.